PeZBOT is a multiplayer bot-mod for Call of Duty 4 and World at War. The aim of the mod is to introduce relatively life-like A.I. to local multiplayer games so those who choose not to go online or prefer to practice against bots before doing so, can. This mod is no longer in development but feel free to download the source code, create your own version and share it in the forums. 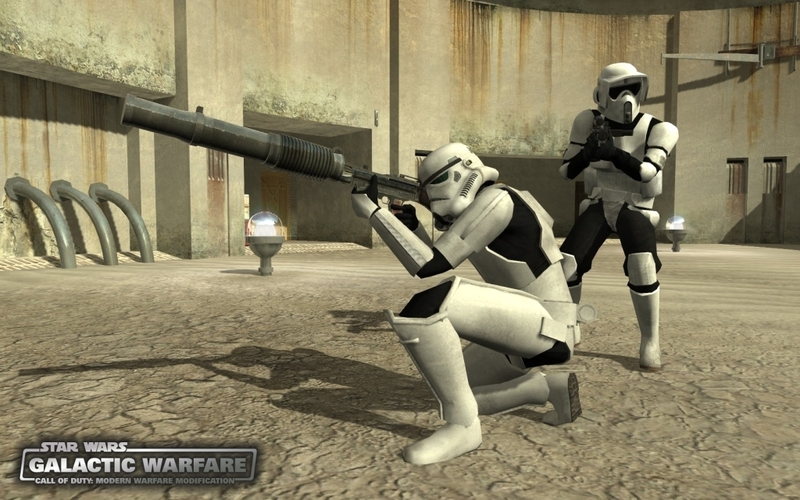 PeZBOT for Star Wars Mod: Galactic Warfare: offline multiplayer bots for those who like to play offline. We have no problem if people want to mod PeZBOT and release their own version, but we have one golden rule: the new mod MUST be renamed in the following format "PeZBOT_" + "MOD NAME OR MAKER" + "VERSION NUMBER". This is to avoid any confusion about which mod is which and by whom. We are more than happy to supply the source for our latest versions and let people update their modded PeZBOT with our latest scripts. We would ask that each PeZBOT modder release the souce to their mod and make it freely available and permitted to be itself modded or added to another version of PeZBOT, including ours if we like the addition. With this arrangement, the PeZBOT mod will be the winner. Instead of two heads working on new ideas and solving problems we can have many. This is pre-alpha code, meaning it is in no way feature complete and may be full of bugs, use at your own risk. We will not be held responsible for any damages this mod does to your PC. Everyone who made and contributed to the awesome SWM for CoD4 - Please see the included readme_swm_gw1.txt for full credits and details of the mod. Awesome mod guys, and thanks for letting us release PeZBOT for it! PEZZALUCIFER - Original author of the mod: did all of the coding until 008p for CoD4. Huge thanks to him for creating this great mod and letting us continue to improve it! ATB - Full credit to ATB who ported PeZBOT to SWM and helped from 009p until 011p: lots of bug fixes and huge additions, the mod wouldn't be what it is today if it wasn't for him! Sparks, Tally, TL-SpacepiG, Whitsel, WCP, Zeroy. - This is pre-alpha code, meaning it is in no way feature complete and may be full of bugs! - The following maps are waypointed to work with PeZBOT SWM: mp_bestine, mp_cloud_city, mp_tatooine, mp_rebellion, mp_anchorhead, mp_jundland, mp_jundland_dusk. Note: mp_not_a_cave is NOT supported! thank you for your support, nice work! Before I download, were do I get the custom star wars maps? @ Bobfuria: Look up "Star Wars Mod: Galactic Warfare" on Mod DB. Download and install that mod by following the instructions provided by the mod developers. Hmmm, can't believe I missed that mod, anyway, thanks for the Pezbot and reply. Now that I finally had time to test, I must post that A pezbot of that mod is a must. Whenever I try to load 10 or 12 bots, it will only bots 0, 1,and 2. I'm also having problems with the Bots walking animation. Instead of walking or running, they slide all over the place. Is there a fix for this. does this mod requires installation of punkbuster? Though the animations are a bit messed up, I really love this. It allows me to actually play the game LOL. Too bad more people don't play online, but until that happens, this is a great alternative. I downloaded the mod and installed it according to the Installation.txt instructions and I don't have those problems. Switching maps while still in-game may cause you to run out of slots (same problem as with normal PeZBoTs), but leaving the game and loading a new map should work (don't think anyone else has reported having this problem). Hey this mod is great! I installed it and everything and it works! But there is a problem though.... After each round the bots go in to spectator mode or just don't spawn.... I tried reloading a new map but that doesn't work... The only solution is to restart the whole game and I don't really wanna do that on every round of S&D..... So any help guys? Am I being retarded or something? Are this works with beta 0.4? 1.0 is out,why keep the beta. How do I play if I can't create a new server? did anybody know how to fix the weird walking animation? I can't create a shortcut I'm on Mac any way to get it working on Mac? This is awesome! I knew about the actual mod, but didn't play as there weren't any people on the servers. Imagine how happy I was to discover this! And it really works! Is it possible to update this to a newer version of Pezbot? I would if I knew how. Also does anyone know how to fix the animations? How am I suppose to use these? There is no create server option in the mod and the cheats wont let you start a map. how add bots only for rebels ? pezbot.cfg -> svr_pezbots_team "axis" or "allies" or "autoassign"